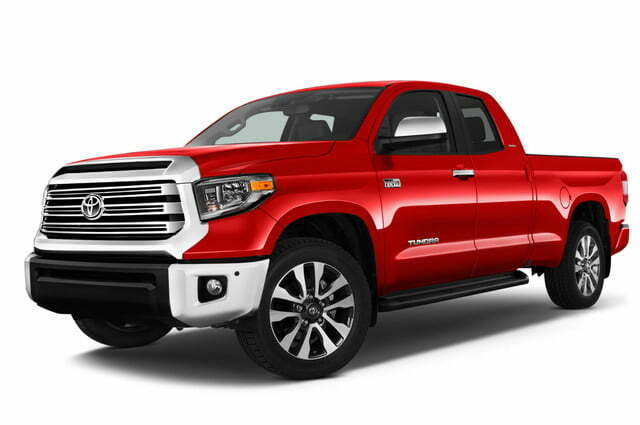 The 2018 Toyota Tundra ushers in the new model year with a TRD Sport package, new safety features, one less cab choice, and revamped front ends. Toyota’s full-size pickup truck sells about six units for every 10 midsize Tacomas. 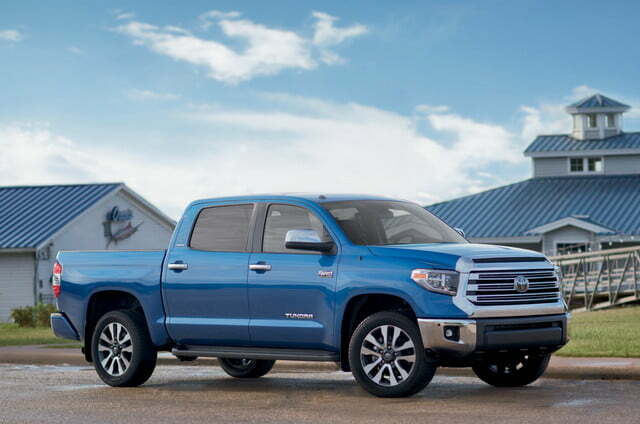 The Tacoma was the fifth best-selling light truck in 2016 at 191,631 units and the Tundra is right behind in sixth place. The 2017 sales numbers through October show the two Toyota pickups holding the same positions in overall truck sales. 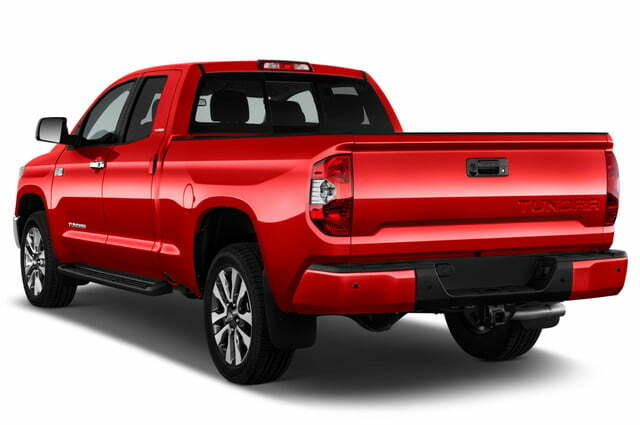 Three of the Tacoma’s six trim lines are TRD models (Toyota Racing Development), which may be one reason for the new 2018 Tundra TRD Sport package. 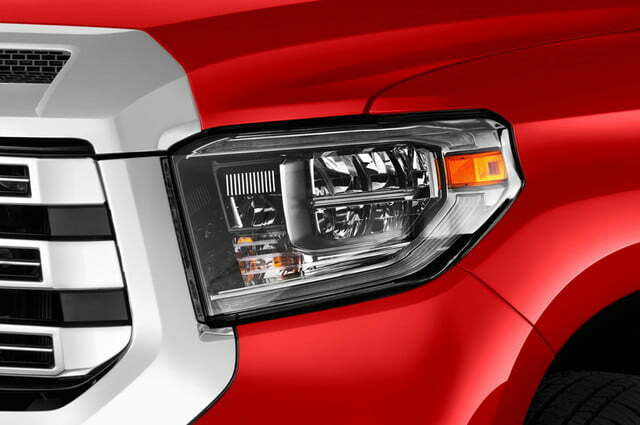 The TRD Sport Package is available as an upgrade to the Tundra SR5 trim. All new Tundras have the Toyota Safety Sense-P (TSS-P) system, the same suite of features now on most Toyota models sold in the U.S. The TSS-P includes a pre-collision system with pedestrian detection, lane departure alert, dynamic radar cruise control, and automatic high beams. You can’t buy a two-door 2018 Tundra. Tundras now have the four-door Double Cab or larger CrewMax cab design — the two-door Regular cab is no longer available. According to Toyota, the cab change reflects trends in full-size trucks overall, where four door trucks comprise the large majority of sales. Tundra engines are unchanged from the past few years. The SR and SR5 trims come with a 4.6-liter DOHC V8 rated at 310 horsepower at 5,600 rpm and 327 pound-feet of torque at 3,400 rpm. A 5.7-liter DOHC V8 that good for 381 hp at 5,600 rpm and 401 pound-feet at 3,600 rpm is standard with the Limited, Platinum, and 1794 Edition trims. The larger engine is also available as an option for SR and SR5 trucks. 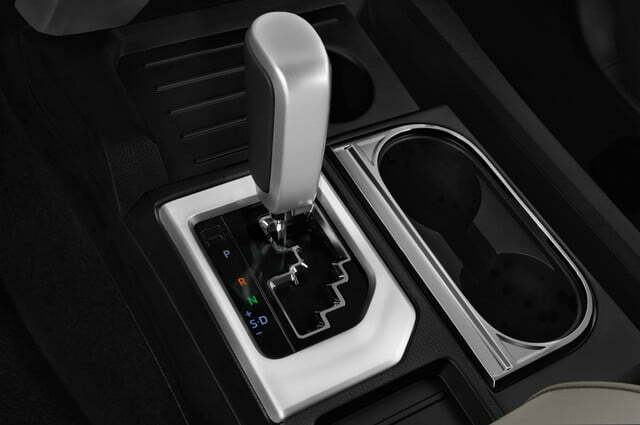 Both engines are paired with a six-speed electronically controlled automatic transmission. Tundras with rear-wheel drive have vehicle stability control (VSC) that works with the truck’s traction-control system to keep a good grip on whatever surface it’s riding along. Tundras also have an automatic limited-slip differential that uses the truck’s brakes to stop wheel spin rather than cut the accelerator — a combination helpful in moving along in mud, sand, and other slippery surfaces. 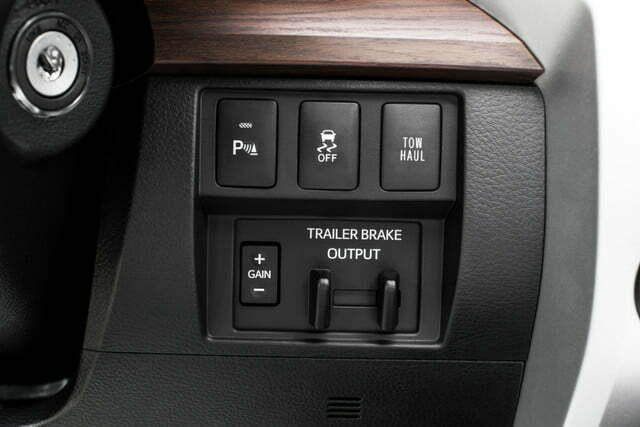 With four-wheel drive Tundras, the driver can select the drive mode via a dashboard dial. The settings for the electronically controlled on-demand part-time four-wheel drive setup are the usual 4×2, 4×4 Hi, and 4×4 Lo. The 4×4’s Active Traction Control does the same job as the automatic limited-slip differential system, so power is maintained while slippage is automatically reduced. 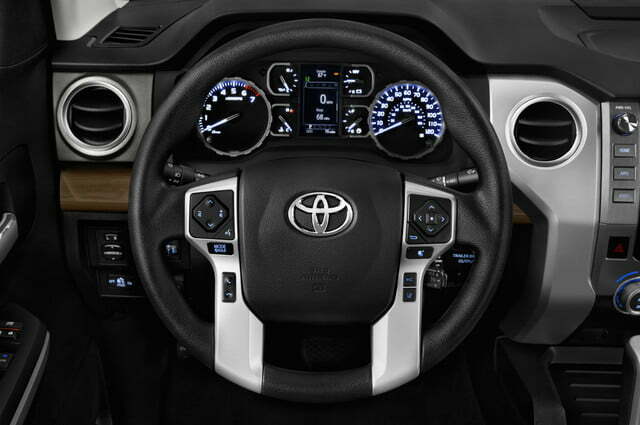 The Tundra’s various levels of Entune infotainment systems serve multiple functions. The basic Entune Audio system has a 6.1-inch touchscreen display with an AM/FM CD player that supports MP3 and WMA tracks and has an aux, USB 2.0, and iPod connections. Entune Audio has hands-free phone support, Siri Eyes Free, voice recognition, and both Bluetooth support for streaming music and smartphone phonebooks. The Entune display, standard on SR trim trucks, is also used with the standard rearview backup camera. Entune Audio Plus, found on the SR5 and TRD Sport has a 7.0-inch touchscreen display and adds smartphone connected navigation, HD Radio, and a SiriusXM Satellite Radio trial. Limited trims move up to Entune Premium Audio with Navigation and App Suite and Platinum and 1794 Editions get the top Entune version plus a Premium JBL Audio system. In addition to the new TSS-P package in the standard equipment list, all trims include the Toyota Star Safety System with vehicle stability control, traction control, anti-lock brakes, electronic brake force distribution, brake assist, and smart stop brake override. Blindspot monitoring with rear cross-traffic alerts is standard on Platinum and 1794 Edition and optional on Limited and SR5 trims. Which 2018 Toyota Tundra is best for you? With five Tundra trim levels, the SR, SR5, Limited, Platinum, and 1794 Edition, plus the SR5’s optional TRD Sport package, there are choices for any Toyota fan seeking the brand and the model’s reputation for reliability and longevity. 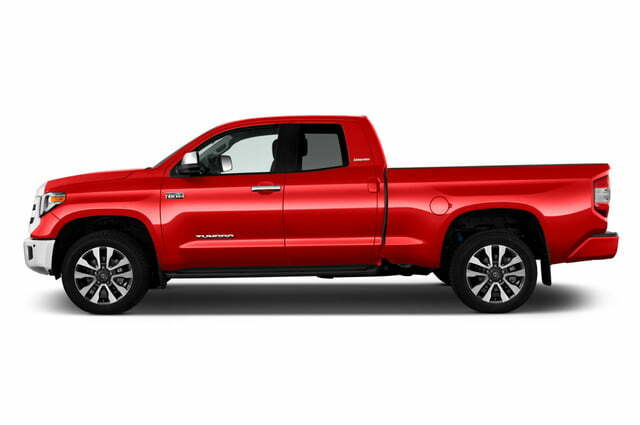 Tundra trim starting prices range from $31,120 for the SR trim with a double cab, standard 6.5-foot bed, and two-wheel drive to the line-topping identical $47,090 base price of the Platinum and 1794 Edition trims, in either case with the CrewMax cab, 5.5-foot short bed, and two-wheel drive. All Tundra trims have roughly the same towing capacity, though the extra torque with the larger V8 standard on the Limited, Platinum, and 1794 Edition trims and an available option on the other trims, will make towing less of a strain. Regardless of configuration and engine, Tundra fuel economy is poor. The larger engine is a bit worse, but no Tundra trim, engine, or drive configuration hits 20 mpg in any EPA rating category. Compare Tundra fuel economy with full-size pickups from Ford, Chevy/GM, and Ram, all of which have ratings in the 20s in at least one measure with the single exception of the Ford F-150 Raptor. In general, though, truck buyers are exceptionally brand loyal, and fuel economy isn’t the first thought that comes to mind when a long time truck owner decides it’s finally time retire the faithful four-wheeled workhorse. Fuel economy isn’t the only cost of long-term ownership, either, so the Tundra’s vaunted reliability rep likely makes up for the fuel mpg — at least in the buyer’s mind. 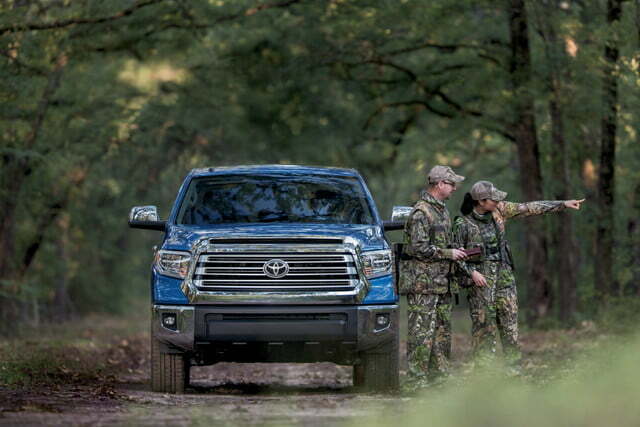 So the biggest reason to choose one Tundra trim over another is the standard equipment. With the possible exception of the SR5 TRD Sport, the equipment differences relate to comfort, convenience, and luxury, not performance. The base Tundra SR trim starts at $31,120 and can go up, but not too far because the SR option and option package lists are more limited than the other trims. The SR has halogen headlights, LED daytime running lights, black heated power outside mirrors, two-speed windshield wipers with de-icer, front and rear mudguards, manual, single-zone air conditioning, and an integrated backup camera. The SR also has 18-inch steel wheels and a fixed rear window in the cab. The SR’s Entune Audio infotainment system has a 6.1-inch touchscreen display, AM/FM CD player with MP3 and WMA playback capability, six speakers, USB, aux, and iPod connectivity, voice recognition, hands-free phone and Bluetooth streaming support, and Siri Eyes Free. The SR seats six with cloth-covered bench seats front and rear. Convenience features for the SR include power windows with one-touch driver window down, power door locks, remote keyless entry, one rear and two front 12V outlets, illuminated entry, and one-touch auto-start. The 2018 Tundra SR5, with a starting price $32,830, adds to the SR trim feature list halogen fog lights, variable intermittent wipers, and the Entune Audio Plus with Connected Navigation App (uses your smartphone nav software), and a 7-inch high-resolution display. Other upgrades for SR5s include programmable auto door lock logic, a sliding horizontal rear window, and rear under-seat storage. 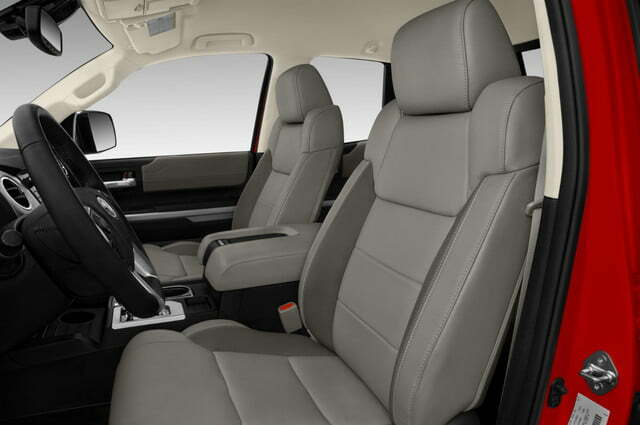 The SR5 also has access to many more individual options and packages. The TRD Sport Package is notable among the SR5 option packages. This option grouping, available only with 4×4 SR5 with the 5.7-liter V8, includes both function and style. The SR5 TRD Sport isn’t a full-on desert racing truck, but it has Toyota Racing Development anti-sway bars and sport-tuned Bilstein shocks. The package also includes distinctive 20-inch aluminum wheels, LED headlights and LED fog lights. Plentiful body-colored components and a TRD shift knob and floormats fill out the TRD Sport Package. 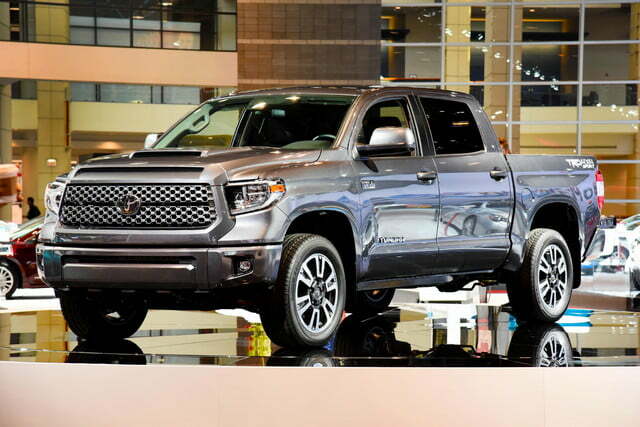 The Tundra Limited, starting price $40,385, is the line’s first luxury-level truck. Differences from the SR5, not counting chrome details and accents where the SR and SR5 use black accents, include LED headlights with auto on/off and LED fog lights, a larger (38-gallon) fuel tank to go with the 5.7-liter Limited’s V8, and automatic dual-zone climate control. 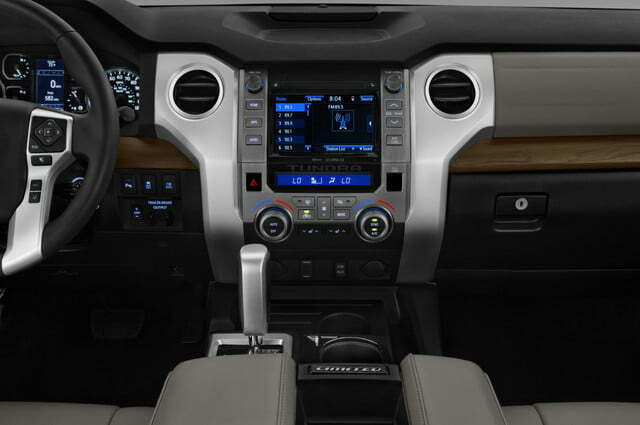 Limited trucks have five-passenger seating, and Entune Premium Audio with integrated Navigation and App Suite and a 7-inch high-res touchscreen display, seven(Double Cab) or nine speakers (CrewMax), and leather heated front bucket seats, 10-way power adjustable for the driver and 6-way for the passenger. 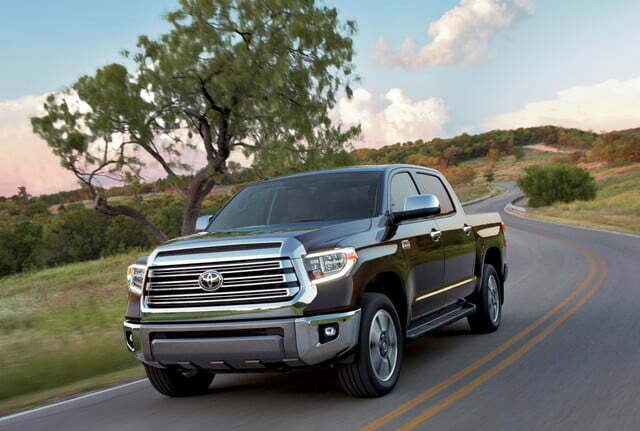 The top-of-the-line luxury trim, the Tundra Platinum, starts at $47,080. In addition to the Limited features, the Platinum includes heated power outside mirrors with turn signal and blind spot warning indicators, puddle lights, and power-folding reverse tilt-down and memory features. The Platinum adds Premium JBL Audio with integrated Navigation and App Suite, 12 JBL speakers including subwoofer and amplifier, and a slew of info, data, and entertainment services. Platinum trim trucks have perforated, heated and ventilated front bucket seats with embroidered backrest, 12-way driver and six-way passenger adjustments including lumbar adjustments for each. The driver seat also has a two-position memory switch. The Platinum feature set includes front and rear parking assist sonar, blindspot monitoring, rear cross-traffic detection, and a glass breakage sensor in the anti-theft system. Toyota’s 2018 Tundra 1794 Edition, starting price $47,080, has a nearly identical feature list to the Platinum trim, except for some distinctive style and badging. 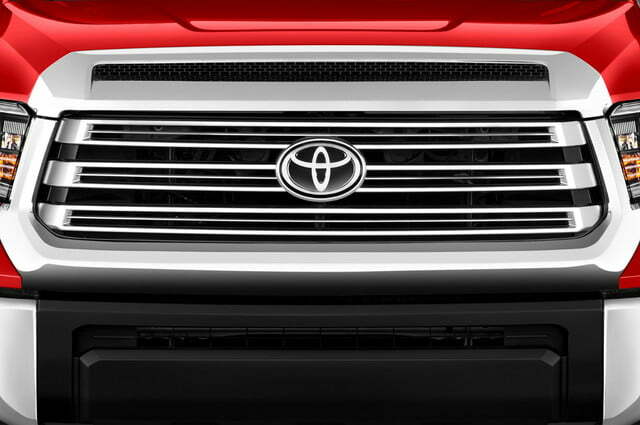 Call this the “Texas” trim because it commemorates the founding year of a ranch in San Antonio, Texas, the location of Toyota’s plant where all Tundras are built.